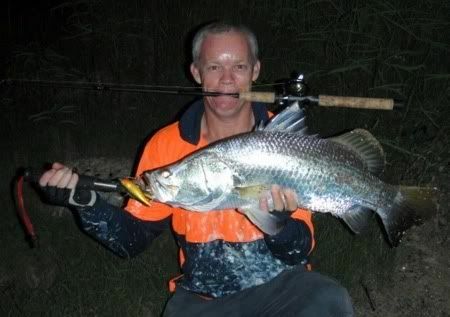 Regular forum contributor 3-rats (Ron) has been smashing the Barra after dark on poppers. And very close to town too. He did me a quick write up from his last trip. Mozza & I decided that Sunday night was going to be one of those nights where our popper skills would turn the fish on… & it did! Getting down to our little spot in town just on dark we started tossing poppers around, there were barra boofing everywhere & bait scared.. screaming off in every direction. We had no hits or looks until it got dark that’s when things change at this spot (barradice)! While my popper sat 20mtrs out near some rocks.. BOOF!! My line pulls up tight & I am on. After a few good jumps & long runs I steer the chrome slab towards mozza who is waiting with the boga grips on the bank, another victim to the new game of barra popping. This fish went 74cm’s & would have easily weighed 4kg, seeing that we release a lot of the fish we catch this 1 came home for a feed.